Transformation is an investment, and one that is not without risk. One of the key risks that companies run into is that change impacts productivity through dissatisfaction, resistance and even turnover of employees. This is one of the reasons to incorporate effective change management into your transformation programs. With any change, you can expect a decline in productivity and an increase in resistance. 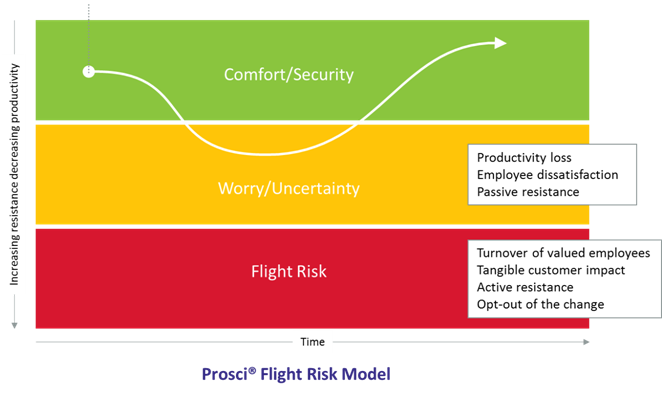 The size of the risk is commonly determined by the time that employees have to remain in a period of discomfort due to change and the intensity of that discomfort. The less effective the change management strategy, the greater the risk. Another key factor often not considered is how much change employees are meant to endure. In its 2016 benchmark report of over 4,500 participants, Prosci reported the number of companies planning to increase their change was over 70% and rising each year. We all know that change is a constant in this day and age. It comes from all directions-from changes in the market and new competition to applications of new processes and technologies. As a result, mid-sized to large organizations can have a lot of changeoccurringat any given timein any group within the company implementing something new on a seemingly continuous, non-stop schedule. Of course, each group believes their initiative is the most important and should take priority. Rarely do they stop to think about how they may be impacting any specific group within the organization. While one group may have only limited impact, another group may be getting hit on all sides. The net result is that people can feel overwhelmed, and in some cases paralyzed, impacting individuals throughout the company. This is known as change saturation, and it can happen at the organizational level, the group level, and the individual level. According to the same Prosci report, 78% of participants reported they were at or near the point of change saturation. And, this number was also increasing. Identifying the symptoms of change saturation is not easy. Some indicators include a substantial increase in sick leave, passive and aggressive negative behavior toward fellow employees or management, rumor mongering, an uptick in negative social media comments, and failure to attend optional meetings about the changes. Ultimately it can result in a massive loss of productivity or high rates of turnover. While it may not be possible to manage all the change programs, it is possible to understand that change may impact people differently,and your program may not be the only one for the organization, group, or individuals that you are impacting. Realizing this and knowing it presents a risk, not only to those impacted but to the health of your project, is an important first step. From here you can take a portfolio approach to change management to successfully mitigate this risk. The next step is to look at the changes going on and identify them. Develop a comprehensive review of changes, the sources for the change,and the groups/departments potentially affected. These are all important questions that should be addressed to properly scope out the necessary resources, tools, and techniques that should be employed to effectively implement and manage the initiatives. While some organizations may be quite complex, which makes identifying every change effort difficult, with some nominal effort, the primary changes can usually be identified quite quickly. Who is impacted? Identify which groups are impacted by the change. Taking this down to the individual level will be to the benefit of the entire organization. Think across geographic and functional positions. How deep is the impact? 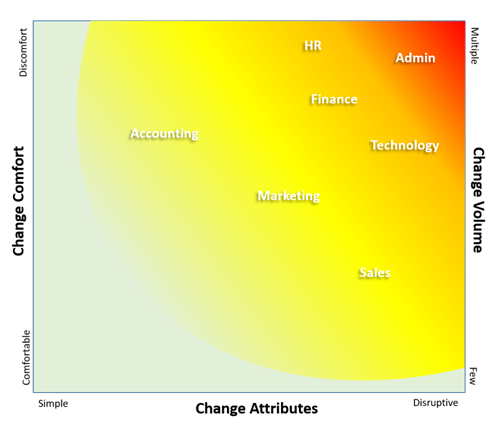 Are the changes highly disruptive, do they have an ancillary impact or does it vary? It helps to have a system of rating the impact of the change and enabling the groups to self-assess will generally provide a more accurate reading. How adept are they ad dealing with change? Some groups and individuals are used to working in disruptive environments, while some experience a higher level of anxiety. Knowing the readiness and acceptance of change will help you understand the saturation point. With this quick analysis, you can begin to identify a saturation point for each group and from there create an assessment of the organization as whole. 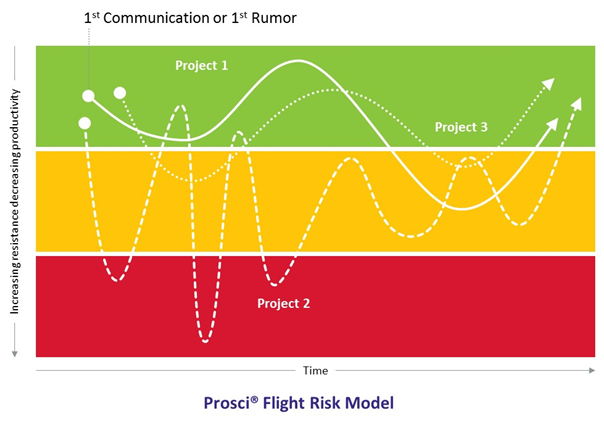 Now you have the makings of a roadmap for mitigating risk at multiple levels. The first thing to look for are the hotspots. Who is getting hit hard by multiple disruptive changes and what groups or individuals are not particularly adept at dealing with it? These are the folks who could be an immediate flight risk. It is more than possible they are already out searching for a new position or creating internal strife, so it is important to engage with them and their managers immediately. Then, you can advance to those who are experiencing a high level of change and either that change is disruptive or they are not change ready, and so on down the line. 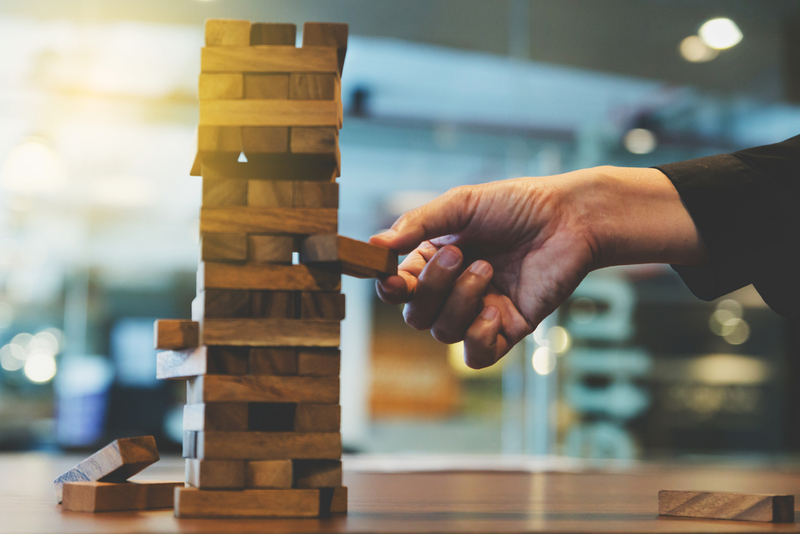 The strategy for mitigating risk is situational, but at least now you can now take proactive steps to fill the gaps. Establishing trust is always the first step in these situations which may involve working with the manager or direct supervisor of the group on appropriate measuresincluding prioritizing the changes, adding resources or tools to help get through the tough periods, coaching in change management, and providing assurances backed by rewards and incentives. And, chances are, if people are in the red zone they may already be aggressively negative or even hostile to the organization, so actions needed might be substantial. Involving your human resources department may be appropriate. If the organization is expected to continue with a high volume of change, which is likely, it may make sense to set up a change management function to monitor the portfolio of programs. In the least, new change programs should continue to be evaluated as they are introduced into the mixto determine what impact they’ll have on the existing portfolio. Current programs can be evaluated to see if they can be restructured to lessen the impact or removed all together for the time being. Continually monitor if the proactive steps taken are effective and to what degree, if any, they need to be adjusted or augmented. This just scratches the surface of the actual work necessary to effectively combat change saturation and change portfolio management. Additional steps can include centralizing information and reporting, formalizing portfolio management, setting up collaboration channels for change, and more. The steps really depend on how big a transformation the organization is going through, what investment you are making and when you want to achieve your returns. By taking a more holistic view of the organizational change you can ensure that people stay engaged, frustration is minimized, resources are properly identified and allocated, programs are successful, and people not only see the benefits, but become agents of change.